You’re just a few seconds too late and the ominous dark black clouds have finally burst. Lashings of heavy water droplets sting your face and fall to the ground like miniature bombs that create havoc in the dust. Your new X2 senses your arrival and the doors unlock ready for your final dash across the road. You open the door and fling yourself into the driver’s seat and take a moment to catch your breath. Inside the brand new 2018 BMW X2 is the provision of comfort from the storm outside and comfort in the form of a warm and snug small compact SUV interior. The new-to-the-market X2 is the smallest BMW SUV. Yep, it’s actually three inches shorter in length than the X1 on which it’s based, and nearly three inches lower. Ok, it’s not a lot of difference but when you look at the two car’s exteriors side-by-side the lower roofline and longer-looking body of the X2 makes the two compact SUVs look different and unique. You can get your new X2 compact SUV with a choice of eight different exterior colours. Let’s start with the moody “Sparkling Storm” colour which sees a shade of dark brown making a comeback. Having the appearance of dark stormy conditions, your new X2 in this colour will look the goods in its earthy metallic paint job. The 2.0-litre petrol models boast M-Spec features and thus 19-inch M light alloy wheels with a Y-spoke style for eye-catching design. They also get the racier M Sport X exterior package design cues which if you want to make a performance statement, then the 2.0 litre M-spec petrol model is the one for you. Gloss chrome exhausts, a neat rear spoiler, special Alcantara/Anthracite seats with contrast stitching in Yellow, sport seats in the front, an M leather steering wheel with multifunction buttons, M logos for both exterior and interior faces, automatic dual-zone air conditioning, and the more powerful engine sets you up nicely for a stylish compact SUV for you and your family to enjoy. A favourite colour of mine is the “Alpine White” exterior colour of the new X2. This is hugely visible in all conditions – perhaps at its best when darker greyer days make visibility difficult. White is the safer colour. Speaking of being able to see clearly; the new BMW X2 SUV gets the modern LED head lighting package with cornering lights. LED fog lights and High-Beam Assist ensure that when conditions do get murky you’ll have added safety for making the drive a little more relaxed. If you happen to like your 2018 BMW X2 SUV in a more conventional and less arty light, then the “Mineral Grey” and “Black Sapphire” exterior colours might appeal to your taste. 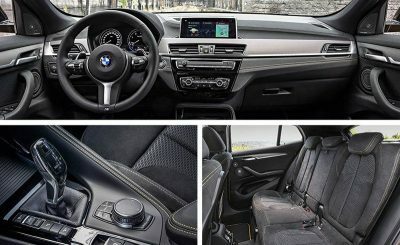 To follow on with how safe the little BMW X2 is – well the car’s 5-star safety result will give some of you a peace of mind when buying this particular model – there are airbags, for front, side and head areas in the front, and rear occupants get curtain airbags along the side of the X2 cabin. It’s a solid little beast, and the rigid strong body shell provides plenty of clout in an accident situation. The new X2 comes with some very good safety features: inner-vented front and rear disc brakes with brake–wear sensors, central locking with an electronic immobiliser and crash sensor, dynamic braking lights, Dynamic Stability Control (DSC), Anti-lock Braking System (ABS), Braking Assistant, Cornering Brake Control (CBC), Dynamic Traction Control (DTC), a warning triangle and first aid kit, cruise control with a braking function, Speed Limiting Information, Lane Departure and Forward Collision Warning, a rear view camera, Park Distance Control (PDC) front and rear and Parking Assist. Rain sensing wipers and run flat tyres are also handy standard BMW X2 safety features. You might like the new X2 in the very vivid “Galvanic Gold” paint job. You’ll be turning heads with this bright and cheery colour. Head inside the cabin, and the BMW X2 is nicely finished with classic BMW style and function. The car’s upholstery has Sensatec technology so it’s easier to clean than you might expect. Air conditioning makes life easy for all, and the foldable rear seats with 40:20:40 split function keeps the luggage carrying options wide open. The instrument panel for the driver has a high-resolution 5.7 TFT display which is beautifully clear and easy on the eye. Your X2 has its interior designed in an Oxide Silver dark matt trim with its highlight trim being a high-gloss black – very smart. Even the base model has a classy sport leather steering wheel with multifunction buttons. The standard seats are very adequate for long distance comfort. There is plenty of good storage options throughout the cabin, and there is even 12V power sockets and two cup holders in the rear centre console. “Misano Blue” and “Medeteranian Blue” are two crisp exterior colours that are hard to overlook. 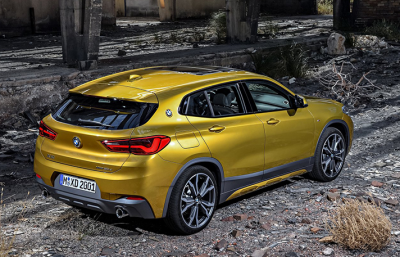 And with a crispness of style, the new BMW X2 provides its owners with all the latest on-board features you are going to be glad you had – particularly if you are one of the younger generation. BMW Connected offers ConnectedDrive Services which includes BMW Online. An Intelligent Emergency Call function is with you all the time for a safety back-up, while Real Time Traffic Information (RTTI) will keep you ahead of the game. Smartphone connectivity also includes a voice control function. There is a DAB+ digital radio tuner, satellite navigation, a 6.5-inch colour touchscreen an iDrive controller and integration hard disc for navigation data, and a quality sound system which puts out 100W through six speakers. USB connection points makes life so easy and up-to-date. This leaves one last colour for all the funky people! BMW’s new “Sunset Orange” sets the new X2 off boldly. It’s a loud colour that edges on being more red than orange, and since its one of the racy colours let’s take a look at the two engine choices you have to power the petrol versions of the 2018 X2. 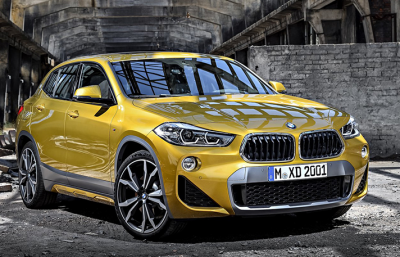 Base models are known as the BMW X2 sDrive18i. Gone are the days where you look at the model number and relate it to the engine size – it ain’t gonna work in this case! This model has the really great BMW TwinPower Turbo 3-cylinder petrol engine with a cubic capacity of 1499 cc. Small, yes; powerful, yes; and efficiency is guaranteed. Run through a 7-speed automatic with double clutch technology, the 3-cylinder can make the most use of its sprightly 103 kW of power and 220 Nm of torque. This grunt allows the small X2 SUV to even scamper through to 100 km/h in a little under 10 seconds. Greater torque and peak power come in the form of the BMW X2 sDrive20i M Sport X Package which still uses the 7-speed sport automatic. The larger 1998 cc engine is a 4-cylinder unit that packs 141 kW of power and 280 Nm of torque – and you still can get to enjoy around 6.0 litres/100 km when conditions are in your favour and your right foot is behaving! When misbehaving, the right foot can make the BMW X2 20i model whip the 0-100 dash in around 7.7 seconds – which will put a smile on your face as a driver of a compact SUV. On the open road you’ll find that the 2018 BMW X2 SUV is a nice size for city streets while still offering BMW-power and enjoyable open road driving. These small SUVs come with direct electronic steering which feels good for the ride, and is precise and effective. An optional M sport suspension is available for those who like to squeal the wheels. So there you have it; positioned snugly between the X1 and the larger X3, the new BMW X2 is another option for those who find themselves caught in the conundrum of what size SUV is right for me. In classical “Goldilocks and the three bears” fashion: go for the one in the middle which is likely to be right! For any more information on the 2018 Audi A7 Sportback or, for that matter, any other new car, contact one of our friendly consultants on 1300 303 181. If you’d like some fleet discount pricing (yes even for private buyers! ), we can submit vehicle quote requests out to our national network of Audi dealers and come back with pricing within 24 hours. Private Fleet – car buying made easy!